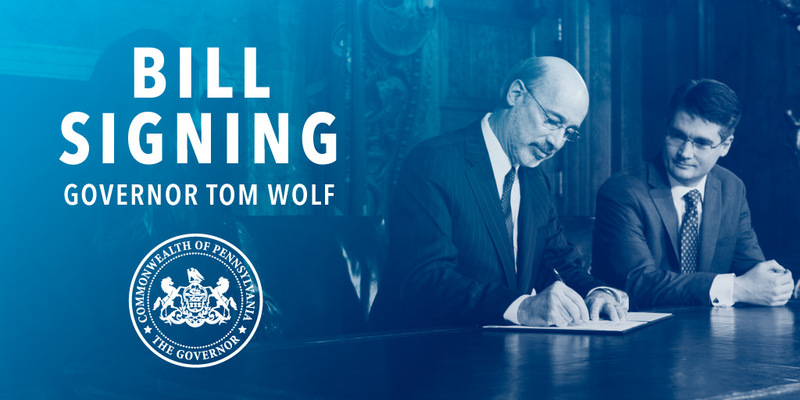 Harrisburg, PA – Governor Tom Wolf today signed fifteen bills into law, including Senate Bill 1221, sponsored by Sen. Costa, which amends the Intergovernmental Cooperation Authority (ICA) Act for Cities of the Second Class, and House Bill 967, sponsored by Rep. Diamond and supported by Rep. Flynn, which begins the regulation of industrial hemp in Pennsylvania. SB 1221, now Act 99, applies stricter ethics laws to the ICA’s executive director and requires greater transparency from the agency. The bill requires the ICA to maintain a website (and post various documents on the site) and to adopt a records retention policy consistent with that of the Pennsylvania Office of Administration. In addition, the ICA must now include in its annual reports a detailed accounting of gaming revenues allocated to ICA by the Department of Revenue, gaming revenues distributed to the city by ICA, and the status of gaming revenues withheld from the city by ICA. “The entire Allegheny Delegation worked together on this because we understand the importance of Pittsburgh to the region,” Rep. Dermody said. “I want to thank the Governor and the Allegheny County delegation for their support of this bill, which will bring much-needed and important reforms to the authority,” Pittsburgh Mayor William Peduto said. HB 967, now Act 92, allows for properly registered individuals to grow, cultivate, and/or market industrial hemp within the confines of the Agricultural Act of 2014. Agencies, colleges, and universities are now able to grow industrial hemp for research purposes. The bill creates the Hemp Research Board, now responsible for developing regulations, applications for registration, inspections, a database of registered persons, registration fees, guidelines for labeling and testing. Act 87 – HB 59, sponsored by Rep. Baker, which provides for hepatitis C testing and treatment and for duties of the Department of Health. Act 91 – HB 871, sponsored by Rep. Sankey, which amends Title 75 (Vehicles), in certificate of title and security interests, and further provides for transfer to scrap metal processor. Act 93 – HB 1167, sponsored by Rep. Barbin, which amends the Crime Victims Act, in enforcement, to provide for state income tax intercept. Act 94 – HB 1856, sponsored by Rep. James, which designates a bridge on the portion of U.S. Route 62 over the Allegheny River in Oil City, Venango County, as the Specialist Jonathan R. Kephart Memorial Bridge. Act 95 – SB 514, sponsored by Sen. Vance, which amends the Generic Equivalent Drug Law to further provide for definitions, for substitutions, for posting requirements, for powers and duties of Department of Health and for immunity of pharmacists under certain circumstances. Act 96 – SB 533, sponsored by Sen. Eichelberger, which amends Title 42 (Judiciary), in other criminal provisions, to further provide for supervisory relationship to offenders. Act 98 – SB 956, sponsored by Sen. Ward, which designates a bridge on State Route 1017 in Ligonier Township, Westmoreland County, as Lt. Eric Eslary Memorial Bridge; & portion of State Route 981 in Mt. Pleasant Township, Westmoreland County, as James Paul Takitch Highway. Act 100 – SB 1227, sponsored by Sen. Blake, which amends the Administrative Code, in organization of independent administrative boards & commissions, and transfers powers & duties relating to public pension system analysis & legislation; IFO; municipal pension reporting & analysis. Act 101 – SB 1267, sponsored by Sen. Rafferty, which amends Titles 74 (Transportation) & 75 (Vehicles), in traffic signals, for defs. & agreement; in general provisions, for traffic-control signals & for expiration of automated red light enforcement systems provisions; allocation. Act 88 – HB 325, sponsored by Rep. Keller, which amends the Auctioneer Licensing & Trading Assistant Registration Act providing for licenses; sales exempt; licensees & applications; registration of assistants & assistant companies; records of sales; penalties. Act 89 – HB 806, sponsored by Rep. Causer, which amends the PA Farmland & Forest Land Assessment Act to further provide for land devoted to agricultural use, agricultural reserve &/or forest reserve, for responsibilities of department & county assessor in establishing use values. Act 90 – HB 835, sponsored by Rep. Bloom, which designates a portion of State Route 74 in Cumberland County as the Marine Lance Corporal Gary Lee Ream Memorial Highway; and designates other various bridges & highways. Act 97 – SB 648, sponsored by Sen, Stefano, which amends Title 75 (Vehicles), in snowmobiles & all-terrain vehicles, to further provide for restricted account and for Snowmobile and ATV Advisory Committee; and makes an editorial change.